I am taking the week off to spend some time with my family. We are celebrating Alethea's 1st birthday and the 4th of July. I'm really excited to see fireworks in the Chicago area. Last year we didn't get to see fireworks on the 4th but we did get to see them in August at an event called "Ashley for the Arts". It was probably the best fireworks display I ever saw in my life. I loved how it was set to music. I leave you with a little snippet of this amazing fireworks display, and I wish you all a safe and Happy 4th of July! I'll be back on Monday July 9th! 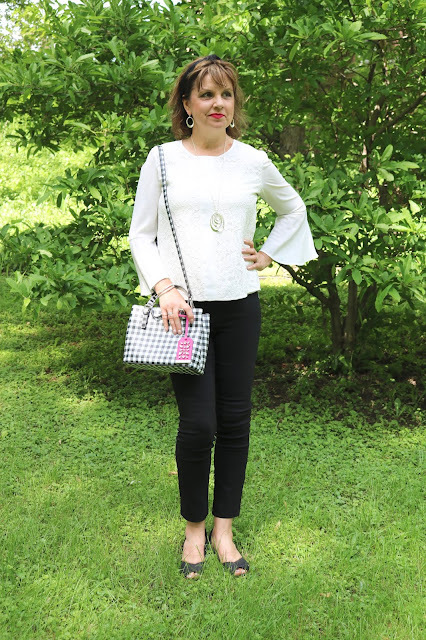 This is an outfit I wore last weekend to attend a local festival: the Ellsworth Cheese Curd Festival. Last year my husband and I attended the event and although we had a great time we felt there was need for improvement and I wrote about it in a travel post. One of the organizers of the event read my blog post about it and encouraged me to visit again next year. I promised I would so we marked it on our calendars and off we went with our DSLR hoping to try all the cheese curd dishes and write a raving, new blog post. Well, it was a disaster. So there will be no new blog post. The festival, which usually averages between 2500-5000 visitors hit the record books with 30,000 people!!!!! Wow! That's amazing! But the lines were so long and unbearable (a 3 hour long wait in the cheese curd line alone), that we couldn't take it and left. Many of the vendors also ran out of food, because no one was expecting that many people. We ended up driving to another local town to have lunch because we were starving. But the good news is that we found a new, local good place to eat. I can't believe we lived in the area for 20 years and have never heard of this place before. And, I have an outfit to share with you. 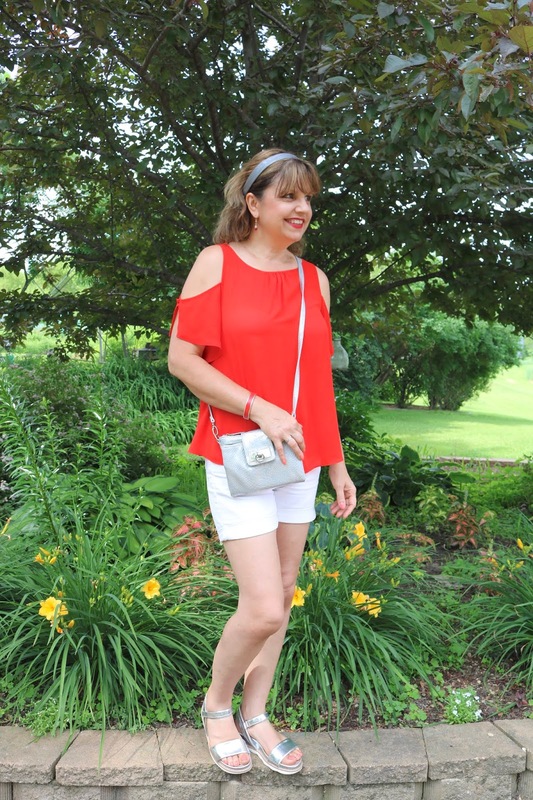 I wore a red cold shoulder top and white shorts (both old from JCPenney) and accented the outfit with silver: a silver headband, silver sandals, silver bag, and silver and red jewelry. Headbands and hats are my best friends in summer. 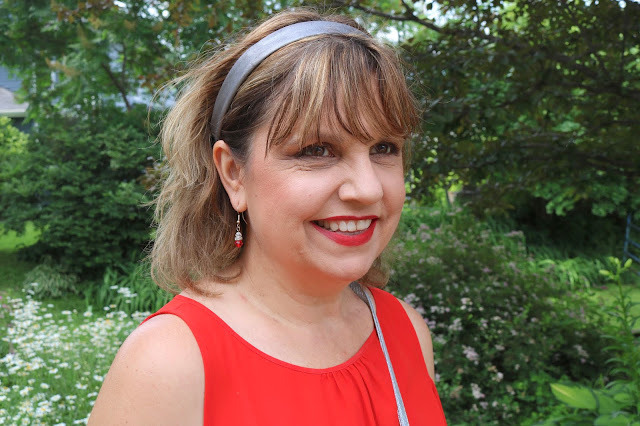 I don't like wearing my hair in a pony tail unless I'm gardening, so headbands are the next best thing to pulling the hair away from my face and off my neck in hot weather. I own at least a dozen of them, so I always have one to match my outfit. The earrings are handmade and a gift from a co-worker when I use to work full time. With the 4th of July right around the corner, this would make a great outfit for the 4th if you change the headband, bag, or shoes to blue! I do have one new item in this outfit to show you and that's these athletic sandals. OH MY GOSH ladies are these sport sandals comfortable! If you're looking for a sandal that you can walk all day in and feel like your floating on air, these are the pair for you! They are called Franco Sarto Olsen Wedge Sandals and I got them from DSW. They also come in black and white. I love them so much I might buy another pair in black! My cold shoulder top has a little button on the sleeve and a split; so it's super comfy to wear. 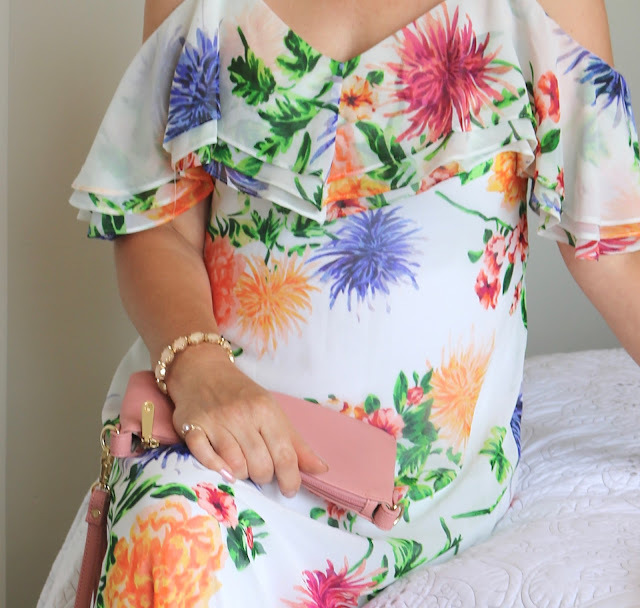 The material also covers the heaviest part of my arm, making it more flattering than many of the cold shoulder tops out there. I always carry cross body bags when traveling. What could be more convenient and more theft proof than a cross body bag? Whoever invented them was a genius! This silver one has been in my closet forever and tends to be the one I use the most. The silver just compliments every outfit. Well, as I stated earlier, we didn't stay at the Festival, but we did find a cute restaurant to dine at in a nearby town. It's name is Corral Bar and Grill and it is located in Durand, Wisconsin. It has gorgeous river views. You could choose to eat inside or out and with these views and perfect weather, we chose to eat out! Sometimes I feel with all my Stitch Reviews you don't see what I actually wear. So here I am! I do post my daily outfits on Instagram in my Instastories, if I remember...haha! I forgot to post what I wore to church on Sunday! And I do have more posts in my files coming of outfits I really did wear! Well, we had to order cheese curds since we didn't get any at the festival. They were good, but no where near as good as the cheese curds we had at the festival last year. Our food however was delicious and very reasonably priced. When you travel as much as we do you get used to seeing high prices on menus. It was nice to see more affordable prices back home! Would you believe each of our plates only cost $7.95 and our drinks were only $1.35? If only we could find these prices when we travel! I order Broasted Chicken. Not sure what "broasted" is suppose to be, but it tasted fried to me. It doesn't matter. It wasn't a "diet day" for me and it was delicious. But it was the french fries that really had me! Wow! These were good! Best french fries I've had in my life. Or was I just starving so much anything tasted as "The Best I've Had In My Life". Hard to know! Well, enough of food and fun, and back to the fashion. 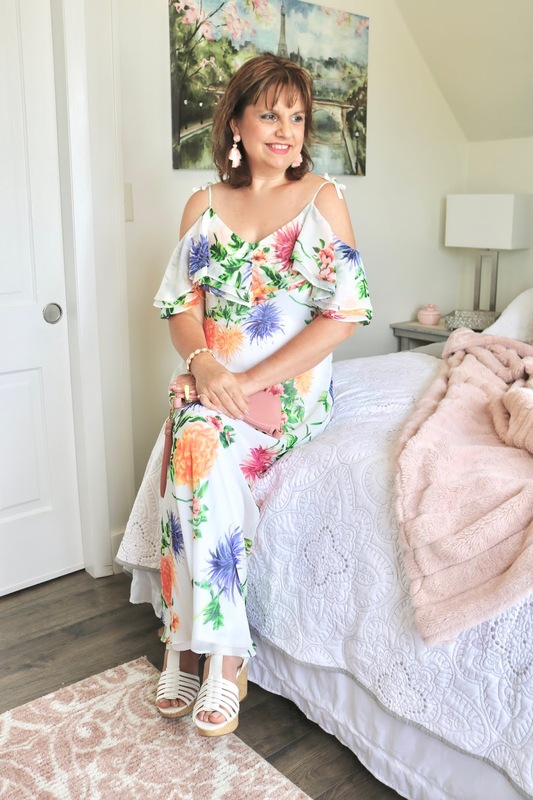 If I repeat a fashion item, I love to show you how I styled it in the past. Here I styled it with skinny jeans. And now for more 4th of July ideas! I wish I could be one of those bloggers that can show you what I'm wearing, making, or creating for holidays ahead of time to give you some ideas, but I'm not! By the time I get around to posting my holiday outfits or creations, the event is over! But you can always search old posts using my search bar! 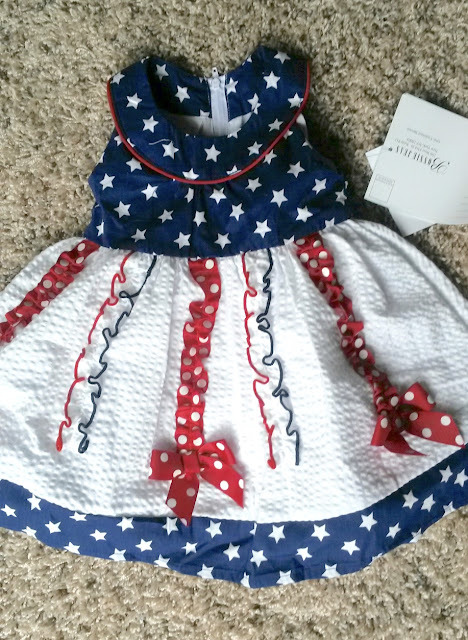 I can however show you what Alethea and I will be wearing for the 4th Of July. I will be wearing this star t-shirt, red linen shorts, white sandals, white sunnies, and probably a white hat or headband. I have never worn anything in-your-face Patriotic for the 4th below but when I saw this star shirt at JCPenney for a mere $5.00 I thought "Why Not?" 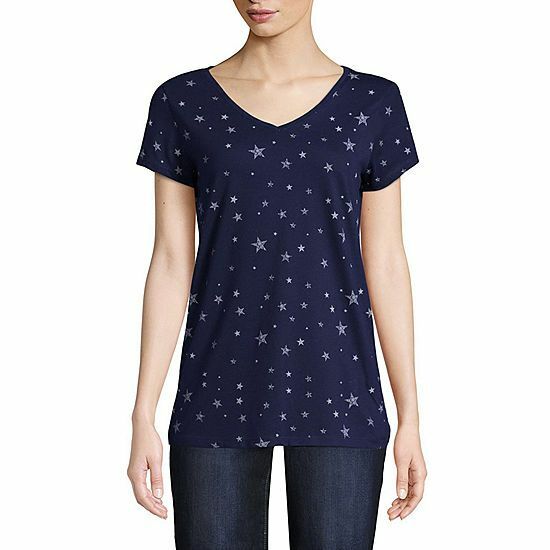 Stars in general are a very popular print, and I thought I could get more use out of this tee after the holiday is over too! 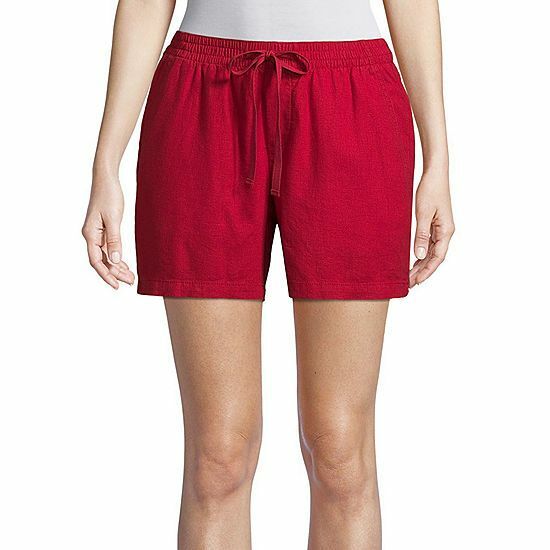 Here's the red linen shorts I bought. Aren't they cute? I think I only paid $12.00 for them. They will be perfect with the hot weather in the forecast. And here is Alethea's Outfit. Isn't it adorable? Would you believe a neighbor brought this over to my daughter just a few days ago? Isn't that a sweet thought? The outfit is so kitschy it's cute! Alethea will look adorable in it and she and I will have some fun photographs together! This is a continuation of a travel series to Savannah, Georgia. If you'd like to start at the beginning, go HERE. The rest of the posts in consecutive order are HERE, HERE, HERE, HERE and HERE. On our third day in Savannah we rose bright and early at 5:00 am so we could be out the door by 7:00. We knew this would be our last full day inside the city so we wanted to see as much as possible. We spent the first three hours just walking the historic streets admiring more historic homes and visiting more squares, then we headed to the Owens' Thomas House to take part in their first tour of the day. 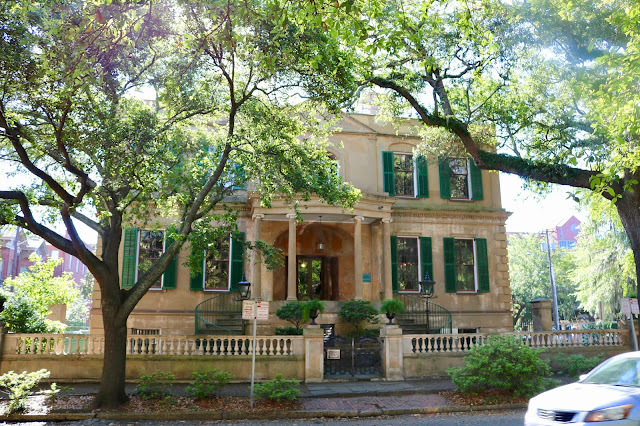 There are so many historic homes to tour in Savannah that you can't possibly tour them all. You have to read all the descriptions and decide for yourself which homes you would be more interested in. We decided on the Mercer-Williams House (already reviewed HERE) because we just saw the movie "Midnight In The Garden Of Good And Evil" and the Owens-Thomas House because it was recommended by the owner of the home we stayed in. 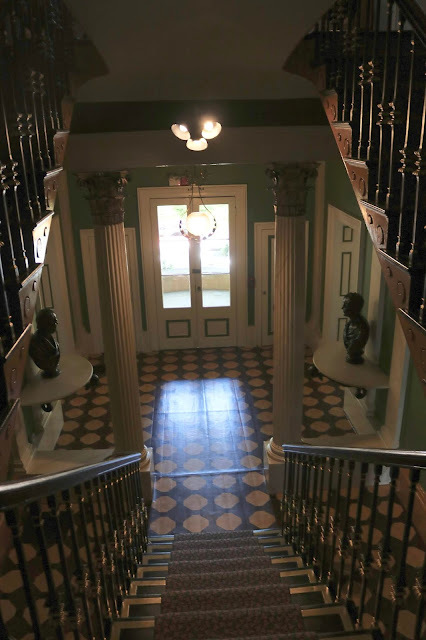 The Owens Thomas House is one of America's finest examples of Regency architecture. The outside of the home is absolutely stunning with it's terra cotta color, green shutters, and two front staircases. Admission to the Owens-Thomas House is steep: $20.00 but you get a lot for your money for it includes admission to two museums, the gardens, slave quarters and it's good for one week if you can't see it all in one day! This is the courtyard garden connecting the house to the slave quarters. This view was taken from the back porch of the house looking down on the garden and towards the slave quarters. This is the view of the back of the house. Regency architecture is all about balance: whatever is on one side must mirror on the other side. That is why you will see two staircases everywhere in this home. The home was built in 1819 and purchased by George Welshman Owens in 1830. He lived in the home with his wife and six children. I have to admit, we did not like the architecture of this home. We thought the balance concept was silly. Quite often the hostess pointed out a door that went nowhere and was just there because there was a door on the other side. We just looked at that as a waste of wall space and a ridiculous way to confuse your guests. But we were also disappointed in the overall style of our home. I said to my husband "I think my own home is more beautiful than this!" and he agreed. BUT , we weren't disappointed that we paid $40.00 to see it for admission to the art museums made it worthwhile. You are allowed to take pictures in this home, but my husband didn't take many because he didn't like it. They do have pictures on their website if you'd like to see more. This is the view of the entry foyer standing on the first landing looking down. Notice two staircases on either side for balance, two columns, and two windows next to the front door? The most interesting thing about this house is the "bridge". Another thing my builder husband thought was silly. But it is definitely unique and I'm sure the children who lived in this house probably enjoyed running across it. The bridge connects one landing to another and spans across the staircase. While in Savannah, you see a lot of sea shell or sea crustaceans inside foundations or pavement. 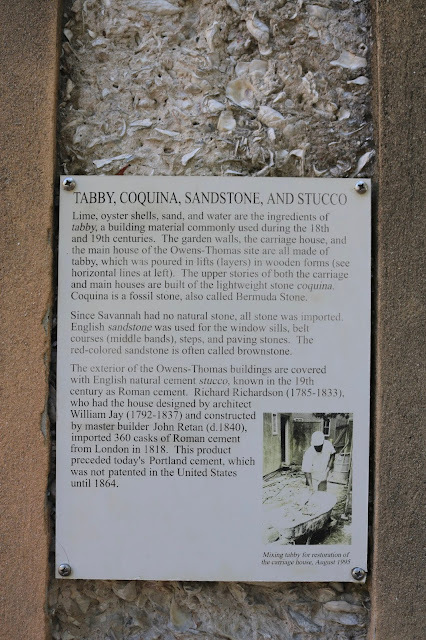 This is known as "Tabby": a regional material made of shells, lime, and sand. Read more about it in the photo below. The old slave quarters is where you begin your tour. In the lower level your tour guide has everyone sit and listen to a brief introduction. There are also photographs and exhibits of the house's history to read and examine. The upper level shows the slaves quarters with a diagram of how the original slave quarters looked like. The slave quarters housed between nine and fourteen slaves throughout it's history. As I stated earlier, your admission to the Owens-Thomas house also includes admission to two art museums. 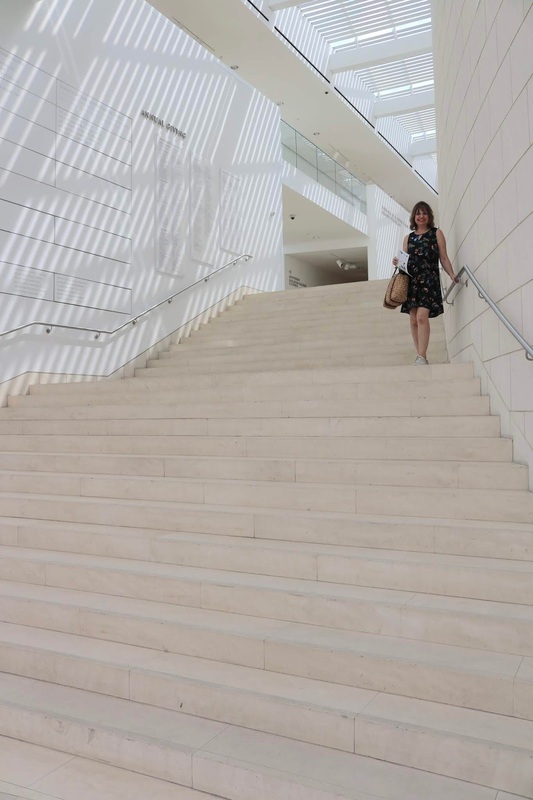 One museum, our favorite, housed older art pieces and the other is a modern art museum. I will cover the older art museum first. My husband is not an art lover, but I am. I even took some art courses in collage. However, if you love history and beauty, you will still appreciate this art museum...my husband certainly did. The Telfair Academy of Arts and Science is housed in a former mansion...another reason to go because you get to see another gorgeous house and some great art at the same time! The mansion was built in 1818 for a Revolutionary War Patriot and in 1875 it was donated to the Georgia Historical Society to be used as a museum. It showcases American and European art from the 19th and 20th centuries. I can't say this enough, even if you don't like art you must stop and visit this museum because it is gorgeous inside. This was my favorite room in the mansion. It is jaw-dropping in person. 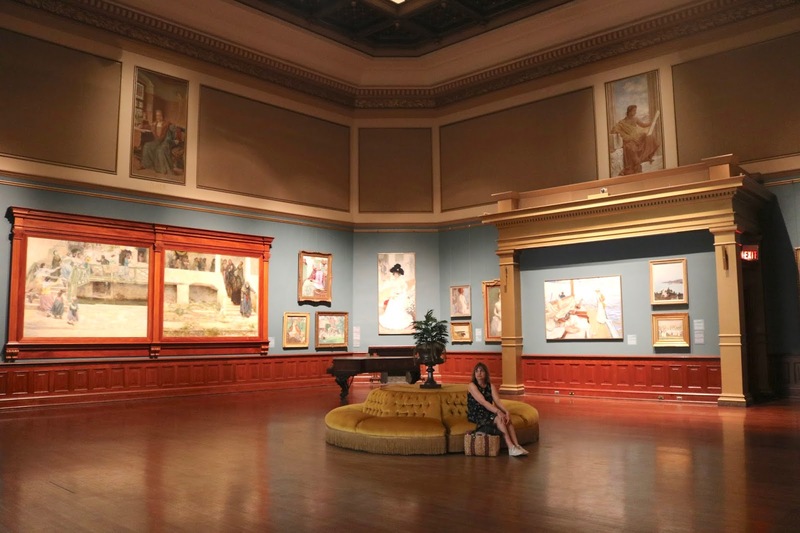 It is a large room filled with beautiful, huge paintings on the walls. In the center is this lovely round settee. I just sat here for 10 or 15 minutes just breathing in the exquisiteness of this amazing room. The paintings were absolutely stunning. Every time I look at paintings like this I always marvel at the artist's talent. How are people able to paint or draw like this? AMAZING! The size of this painting blew us away. Look how big it is! I stood right next to it to give you some perspective. I loved this painting. Isn't it gorgeous? 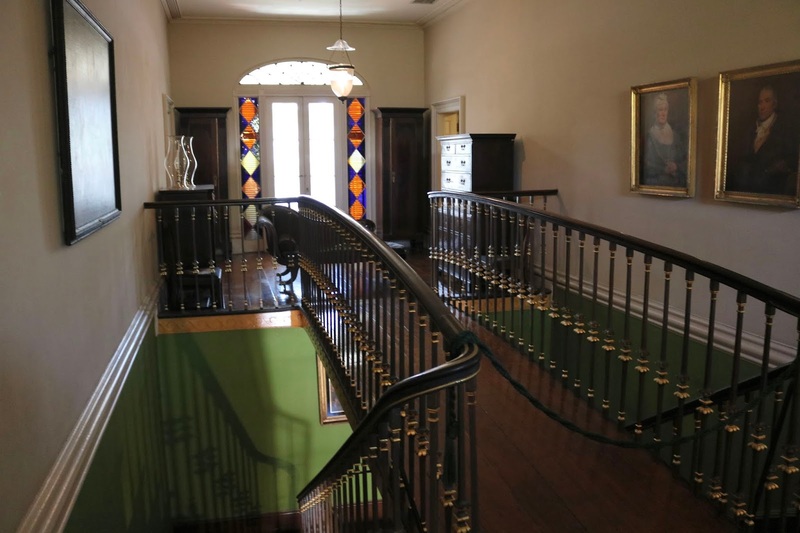 In addition to artwork, the mansion also contains two period rooms. This is the dining room. The staircase when you just walk into the museum. The upper level houses the paintings I just showed you, and the lower level holds sculptures. This is the sculpture room. There are also painting too. Looking back at the staircase from the end of this room. The other museum you get to see with a ticket to the Owens-Thomas House is the Jepson Center. This museum houses modern art and the building itself is very modern, and probably the only modern building in historic Savannah. I do not like modern art but I LOVED this building. It is so gorgeous! The light in this building is stunning. I loved this grand staircase. Now, I have already admitted that my husband and I do not like modern art. But I wanted to go into this building to both experience it's amazing architecture and to find "Bird Girl"! If you remember my post from Savannah, Day 2 I talked all about "Midnight In the Garden of Good and Evil". This sculpture, which was photographed by Jack Leigh in the Bonaventure Cemetery became the cover for the book. It made such a striking book cover that it became known as "one of the strongest book covers in history". The statue was so popular with tourists, that it had to be moved to a museum for safety reasons in 1994. In 2014 the statue was moved from the Telfair Academy to the Jepson Center. A wonderful exhibit now houses this famous statue! Replica's of this statue are for sale all over Savannah. I wanted one so bad! But to buy one about this size would set you back about $400.00. Ugh! Someday! She sure would look beautiful in my garden, wouldn't she. Next week, I'll cover some other highlights of this day like Leopold's Ice Cream! 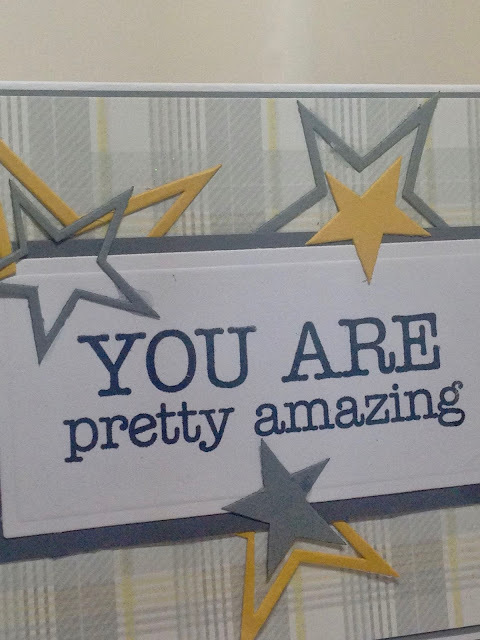 If any of my fellow paper crafting bloggers are still following me I have a surprise for you: I MADE A CARD! I know, shocking right? Believe it or not, I do still craft. But my issue is I can never post what I crafted until after the holiday or event because I don't want my loved ones to see them. Then, I don't post them on my blog because I think "Why would anyone want to see this now that the holiday is over?". So, they never get posted. I did however "save" this year's Easter's cards in my files to show next year....BEFORE Easter. The card I have to show you today I made for my husband for Father's Day. However, because it's really just a masculine card I felt I could post this on my blog after the holiday was long over. 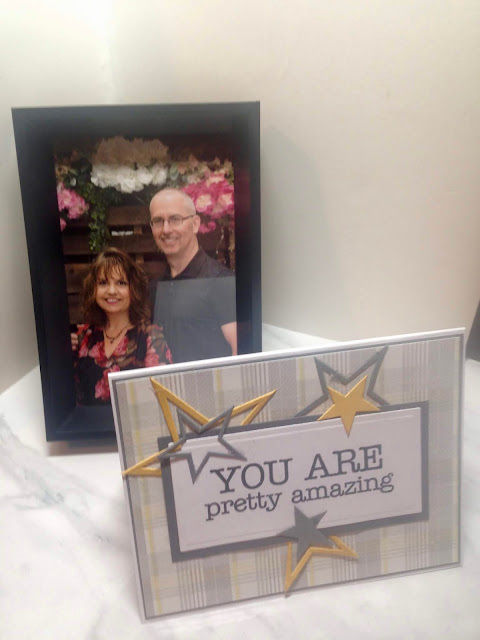 I made this masculine card for my AMAZING husband. 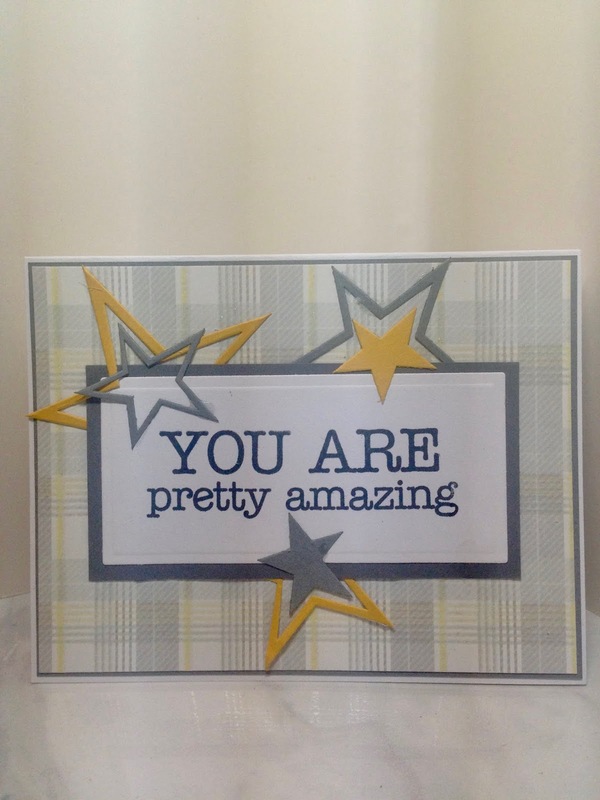 The sentiment is from an old MFT stamp set, but you could easily print this sentiment out on your printer too. I then cut rectangles with Spellbinder's Dies and the stars were cut with Cuttlebug Dies. 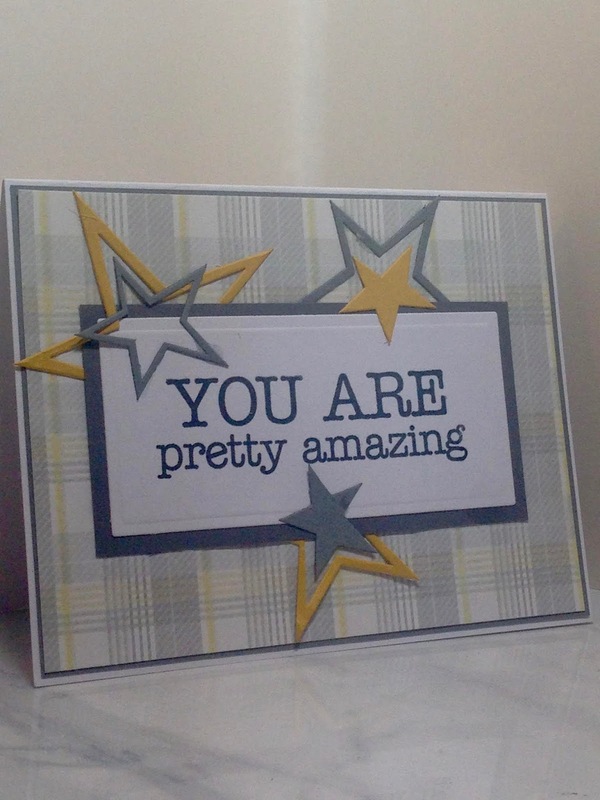 I chose a masculine plaid paper for the background. For the inside, I added another MFT sentiment from the same set, and more stars. 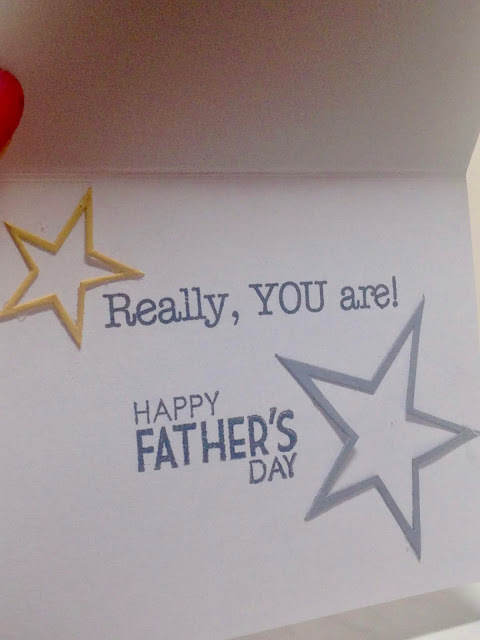 The "Happy Father's Day" sentiment was a separate old stamp from my collection. I think I picked it up in the dollar bins at my local craft store. 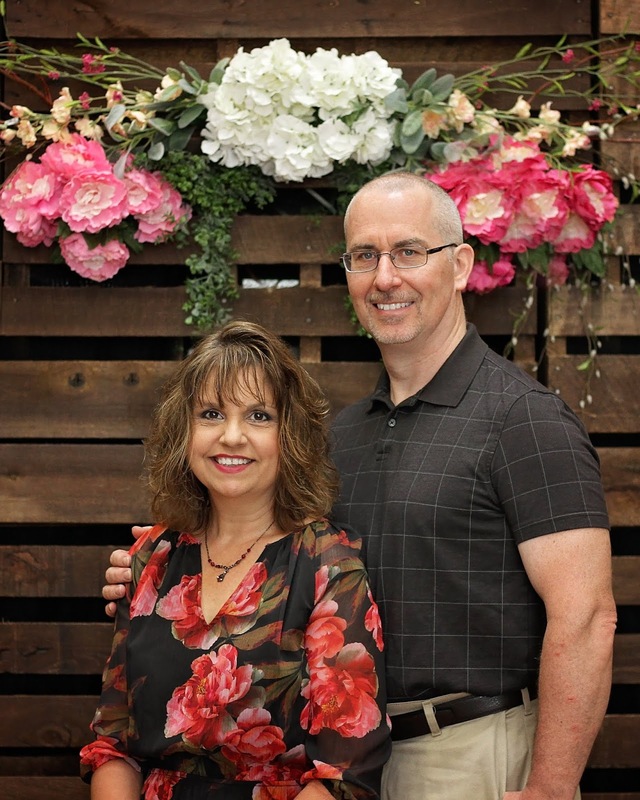 For Mother's Day our church offered to take free family portraits of all the moms and their families. Unfortunately my children couldn't be with me that day, but we thought "Why not get our picture as a couple taken?" It was a wonderful treat to finally get a nice photograph of just the two of us. Most of the time either I'm taking his picture or he's taking mine. I love the way it turned out too! It's so rare when we both look good at the same time! I wore the same dress I wore in Savannah and he picked a dark polo to coordinate with me. We got lucky and the background went very well with what we chose to wear. I had no idea what the background would be before the photo shoot. I received the prints just in time for Father's Day so I printed one out and framed it in a masculine frame for his desk. What better gift to give the man who has everything and doesn't want anything. 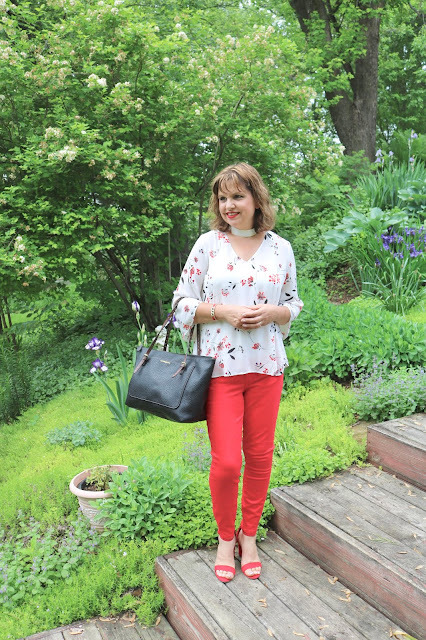 Today I am finishing my review of my last Stitch Fix Box, Fix #17. I've already reviewed four of the items, scroll to the bottom of this post to see those pieces. This stunning maxi dress is the last item I have to review from that Fix. 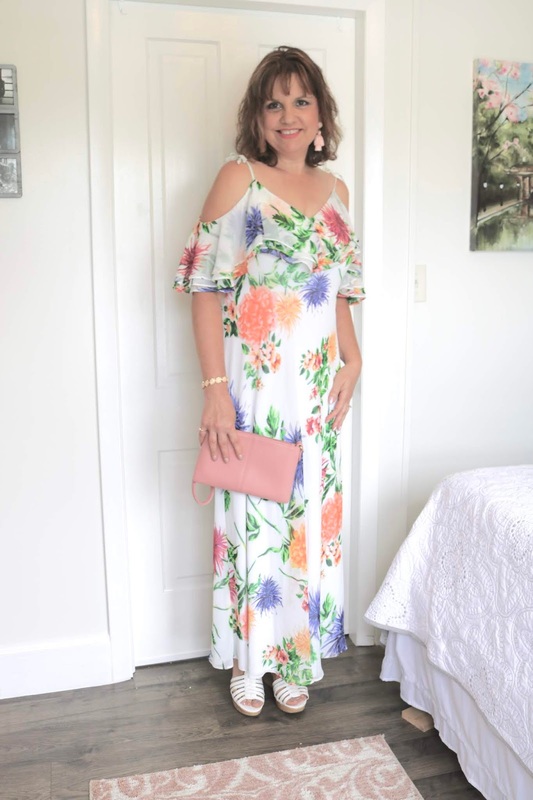 It is by Calvin Klein and is called "Desmona Ruffle Detail Cold Shoulder Maxi Dress". This dress is absolutely beautiful. I fell in love with it the moment I saw it. I loved how romantic it was with the white fabric, beautiful floral print, cold shoulder, and the ruffle overlay over the bust line. I felt like a princess wearing this dress. But, I had to send it back. It was very expensive, $138.00, and I honestly had no idea where I'd ever where it. It is very dressy to me, too dressy to wear to church. 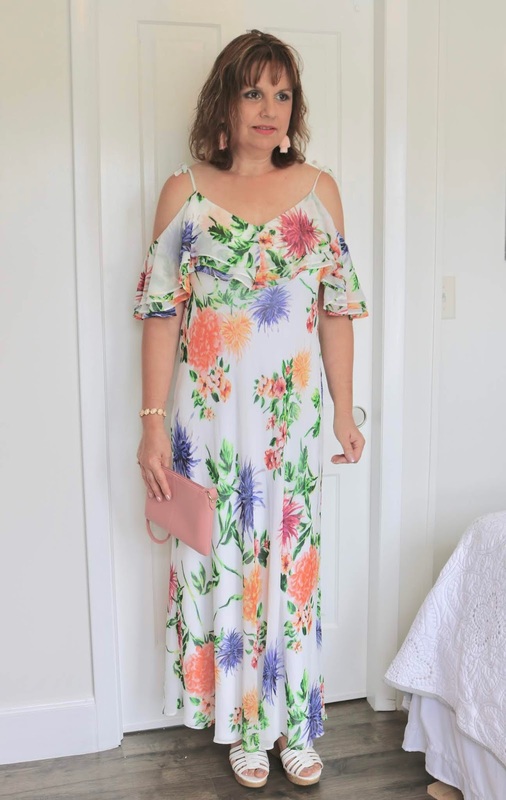 I do have a wedding coming up at the end of summer, but I really don't like wearing white or black to weddings so I didn't think it would work for that either. Plus, I already bought a dress for the wedding. I really liked the ruffle over lay over the bust. 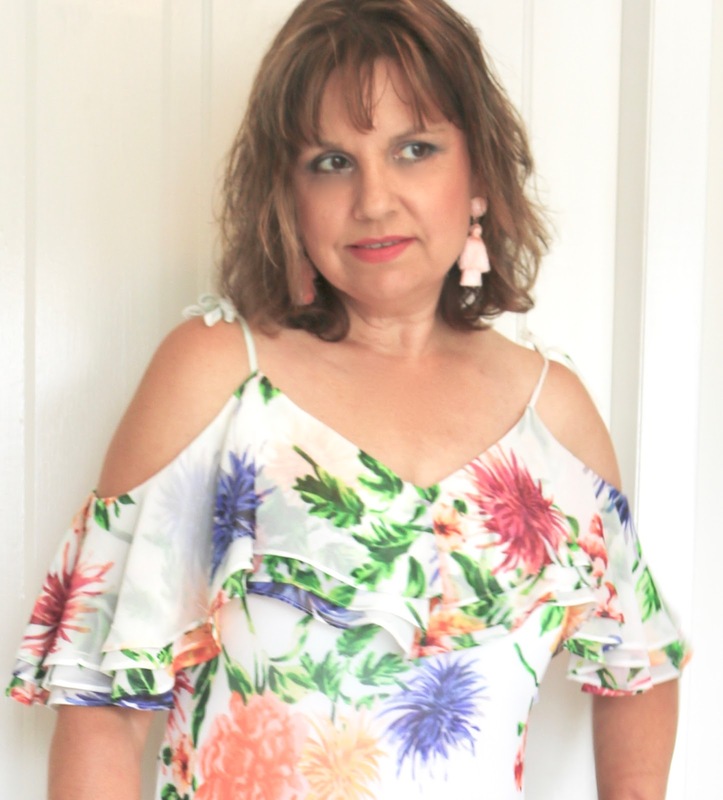 I've always stayed clear of ruffles around my chest because I thought it would make my large bust look even bigger, but this seemed to do the opposite. 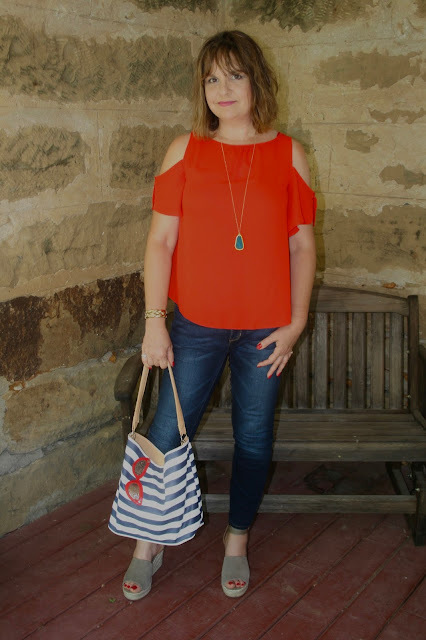 I'm going to keep an eye in the stores for more tops with ruffle overlays and try some on! For jewelry I chose dramatic pink tassel earrings (Charming Charlies). On my wrist I wore a rose gold bracelet (Francesca's) and carried a pink clutch. I chose these white wedges (old, JCPenney) for footwear. I know you're all going comment what willpower I have to send this dress back, cause you always do! It is gorgeous, but impractical. And this time my husband and I were in complete agreement. He knew I'd never get enough wear out of it to justify the price. But I enjoyed trying it on and feeling like a princess if only for a few minutes! 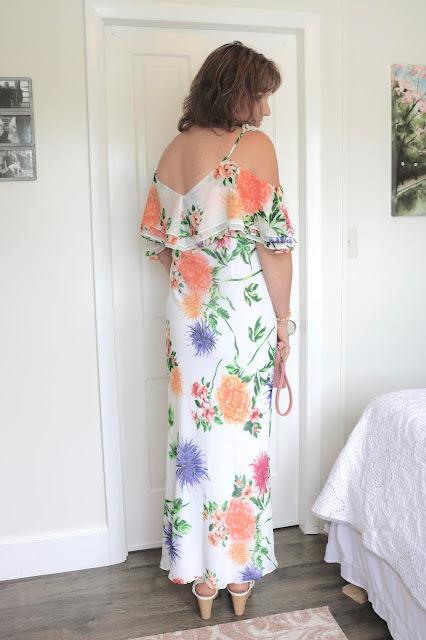 I would have loved to have done a photo shoot wearing this dress in my beautiful garden, but I didn't dare for fear I would get it dirty and then not be able to send it back! So we did the photo shoot in my guest room instead. 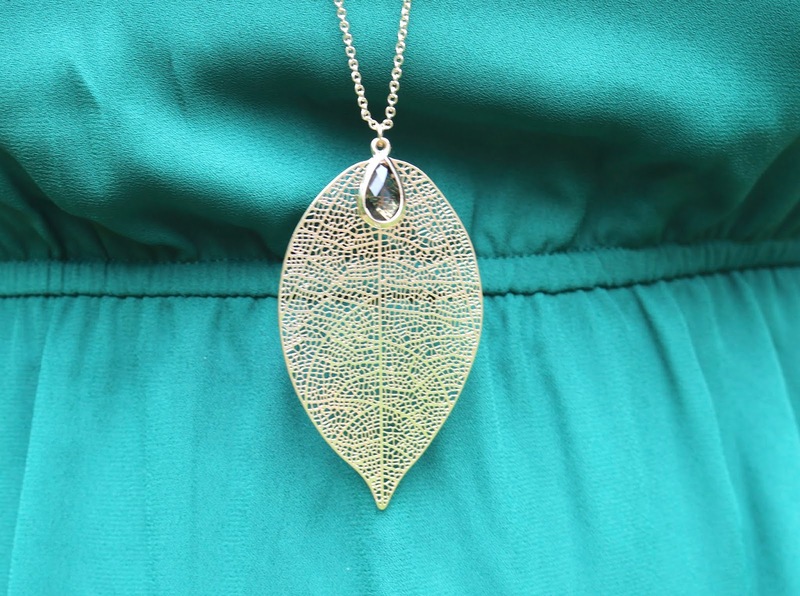 And now for a review of the entire Fix: Stitch Fix Box #17! Towne and Reese Lavi Leaf Pendant: KEPT! 41 Hawthorn Bogota Dress: Returned! Kut From The Kloth Candace Split Hem Skinny Jean: KEPT! Calvin Klein Suit Separates Haesel Lace Detail Bell Sleeve Blouse: KEPT! In summary, this was my best Fix yet since I started receiving monthly Fixes. I kept 3 out of 5 items. I actually LOVED everything, the maxi dress was returned simply because it was impractical and too expensive. I also loved the green dress I returned, but the fit was just not right for my body type. I do hope my stylist sends me another dress in that beautiful green color because it's definitely my color. So what do you think? Did I keep and send back the right items? I'd love to hear from you!